After the Great Migration of 2017 this past weekend, we ran into some snafus regarding various iterations of feed subscriptions. The short story is, when a blog has existed in some form or fashion for long enough, the technology changes and isn't always compatible with the Newer and Better and Shinier. This is technical biz, but if it interests you: there were five different RSS feeds people were subscribed to via Feedly, Blog Lovin', and other aggregates, and we were only able to save two of them. By my estimates there were 2000+ readers who were lost and I felt sick about it last night. I tried to explain to Nate it isn't the loss of readership that bothers me—if people want to keep reading, they'll find they need to resubscribe and if they don't, I haven't lost anything and they haven't either. It's the feeling of disappointing people without intending to. I felt a bit like I was taking something away from someone in a sneaky way which they had been merrily ingesting without any interference from me previously. Maybe that doesn't make sense to you, but it does to me. After I tried to explain this to Nate in grown-up words with real thought and real logic behind them, I dissolved in tears, the like of which I never engaged in pre-2015 and post-2015 have only become more common. It ended with me blowing my nose on his t-shirt and telling him I'm sorry for being such a disappointing wife. I'm sure he thought he was getting one thing when he said "I do," and I've turned out to be something else entirely different. I don't feel like myself. I don't think like myself. On the off-chance I venture a look in the mirror more than while I brush my teeth, I don't even look like myself. I saw a photo from our wedding the other morning and thought: who is that girl and where did she go? Marriage changes us and plenty of people might defend me with those reassuring words, but it's more than marriage. It's the moves. It's the miscarriages. It's the suffocating fear when I hear sirens or gunshots in our neighborhood. It's meeting new people. It's not trusting church leaders like I once did. It's still having to depend on a GPS for almost two whole years. It's the lack of job security or home security or community security. The face in the mirror today is lined with life it never dreamed of two years ago. I thought last night, while my snot pooled on Nate's shirt and he prayed for me: there are a lot of things in life that surprise and confound us, things we didn't expect or things we expected and then turned out completely different than we thought. I'm no stranger to the unexpected and life has never been one smooth Sunday sail for me. But I used to be able to close my bedroom door to it at the end of a day and secret my struggles away. I thought it be would romantic to someday share those struggles with someone, but trust me: romance is a luxury our marriage has not had time to surface for yet. Someday, maybe, we will whisper sweet nothings and write love notes and give sneaking surprises, but more than likely we will continue to gulp air where we can find it and give the gift of whatever we can manage to give today. It's not romantic, it's not even sweet. But, like I told Nate last night, I know it's working in us something good, even if we can't see it today. There's a strange comfort in the midst of that, a Severe Mercy, Sheldon Vanauken called it. God is tending to us with a scalpel these days and someday, maybe, there will come a time when He soothes us with balm or a healing compress. But today it's all scalpel. For our good. For His glory. But still not what we thought we were signing up for when we said, "For better or worse." Speaking of signing up, there's no way for me to tell those of you who were lost in the migration that you were lost, so if you're subscribed to Sayable via anything except email, you might want to check your feedreader and update the RSS. Rachel Joy Watson sent me her small book of poetry a few weeks ago and I've been meaning to tell you about it. If you like poetry, I think you'll enjoy it. But if you love people and narratives and arcs and Jesus and how He heals, I think you will love it. I read straight through it in one afternoon, laughed, cried, and was grateful God made us humans with the full spectrum of emotions. Stand back, look ahead, and consider where you are going. Allow yourself to be drawn up into the mind and perspective of God. Try to see things as he sees them. Relax! If you’re anything like most well-adjusted and healthy American people, there are periods in your life where your existence will be repugnant and seemingly impossible. During those, the most courageous thing you’ll ever do is to get out of bed anyway. And eat. And work. And read to your kids. And lie near to your loved one, though you may not recall what that means. 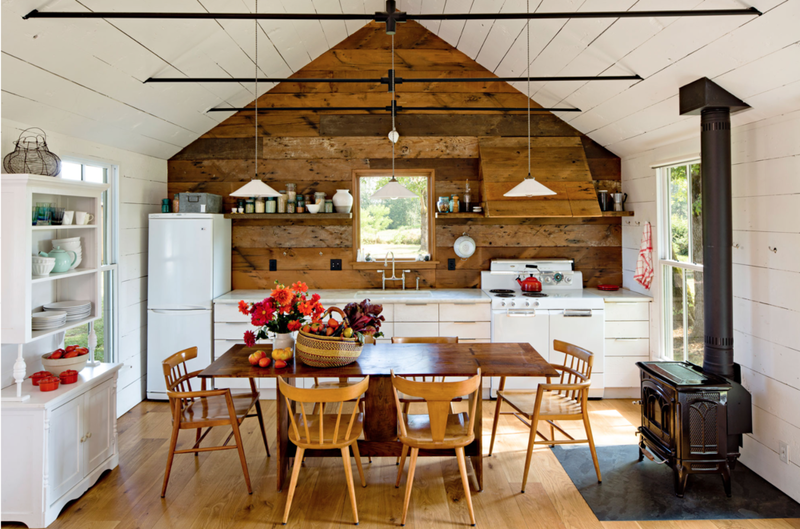 Ever since I saw this kitchen, I've been dreaming of a tiny house. It's not a true tiny house, but it's still pretty small and I love the pared down, simple wall, no frills kitchen. Click the photo for more images from this home.